St Luke’s Episcopal Parrish House Seaford, DE will host our Code Purple Sussex County men’s shelter for the month of January. All guests seeking shelter with Code Purple for Western Sussex County will need to arrive for intake from 7pm to 9pm for the entire month of January. Dinner will be served at 7pm. Our female guests will be transported from St Luke’s to Gateway Fellowship at 9pm and then return to Seaford at 745am the next morning. Any donations will also be received at St Luke’s after 7pm nightly. We are still in need of intake, overnight, and transportation volunteers along with dinners delivered. Please think about joining us any evening we are open to ask questions and see what it entails to volunteer with us. We invite church and civic groups to come in and fellowship with us! Visit http://www.codepurplesussexcounty.com for more information! Gateway Fellowship will be open from now till December 31st, 2016 for Men, Women, and Children. In-Take is 7pm till 9pm. Dinner is provided. Gateway is located at 8110 Cannon Road, Bridgeville, DE. Avenue United Methodist Church will be open Wednesday, December 28th to Saturday, December 31st, 2016. In-take is 7pm till 9pm. Dinner is provided. Avenue UMC is located at 20 N Church Street, Milford, DE. Shepherd’s Office House will be open Wednesday, December 28th, 2016 to Friday, December 30th, 2016. In-take is 5pm till 6pm. Dinner is provided. Shepherd’s Office House is located at 408 N Bedford Street, Georgetown, DE. To make arrangements to stay at any of our shelters please call the hot-line at 302-519-0024. Avenue United Methodist Church will be open Tuesday, December 27th to Thursday, December 29th, 2016. In-take is 7pm till 9pm. Dinner is provided. Avenue UMC is located at 20 N Church Street, Milford, DE. Gateway Fellowship will be open from now till December 31st, 2016 for Men, Women, and Children. In-Take is 7pm till 9pm. Dinner is provided. Gateway is located at 8110 Cannon Road, Bridgeville. Avenue United Methodist Church will be open Thursday, December 22nd to Sunday, December 25th, 2016. In-take is 7pm till 9pm. Dinner is provided. Avenue UMC is located at 20 N Church Street, Milford, DE. Shepherd’s Office House will be open Thursday, December 22nd, 2016. In-take is 5pm till 6pm. Dinner is provided. Shepherd’s Office House is located at 408 N Bedford Street, Georgetown, DE. We are in need of overnight volunteers to cover the nights we are open. With no volunteers we can’t open. We are also in need of dinners. If you can prepare a meal please email us at sussexcountycodepurple@gmail.com. Visit us at http://www.codepurplesussexcounty.com to learn more about volunteering! 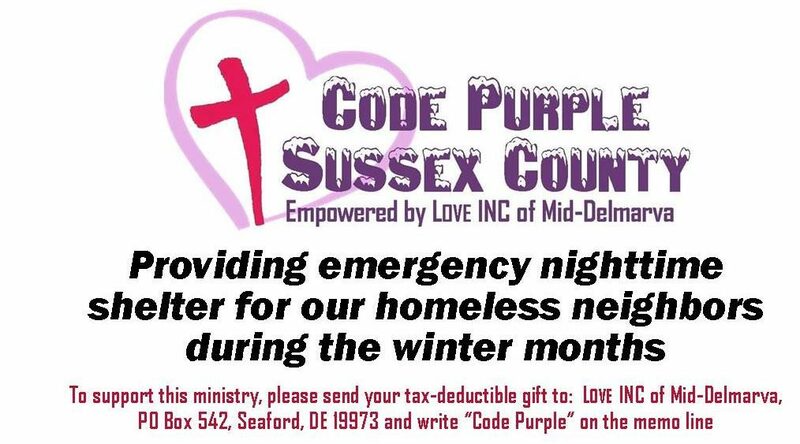 Code Purple Sussex County in effect Monday, December 12th. Can you provide a meal for our Code Purple Shelters? We are in effect until Sunday (at this time) and we are in need of someone bringing in dinner for our guests. Please log in to our online calendar and sign up for the shelter you can provide dinner for and we will email you with the amount of guests to prepare for. Any questions please contact Vikki Prettyman at 302-853-0997. Bridgeville: Gateway Fellowship is located at 8110 Cannon Road, Bridgeville, DE . In-take is at 7pm. Dinner will be provided. MEN, WOMEN and CHILDREN. Code Purple will remain in effect for the following shelters Thursday, December 8th till Sunday, December 11th. Milford: Avenue United Methodist Church at 20 N Church Street, Milford, DE. In-take is at 7pm. Dinner will be provided. MEN ONLY. Georgetown:Shepherd’s Office House at 408 N Bedford Street, Georgetown, DE. In-take is from 5pm-6pm. Dinner is served at 6:30. MEN ONLY.